DRY FORK, W.Va. — You don’t have to go to New Hampshire or Vermont to taste sweet success. A trip to Dry Fork in Randolph County is far enough. That’s where John Dalen has created West Virginia’s largest maple syrup works.It started just one year ago on several acres he inherited from his great-great-grandfather who settled in Randolph County in 1876. Dalen has worked as a school teacher, construction jobs and the past few years as a cattle farmer. However, when he got some encouragement from friends, he decided to take a chance on the maple syrup business. Owner John Dalen thinks the state’s maple syrup, such as that from Dry Fork Maple Works, benefits from the”better timber, better soil, more moisture, a longer growing season, good topography” in West Virginia. “I knew I had the resource. I was persuaded by some individuals who said this was the thing to do. So I crunched some numbers,” explained Dalen. It was a risky move. Dalen shelled out tens of thousands of dollars to get his operation up and running by January of 2014. With 19,000 taps in place and 54 miles of tubing running from the trees to his sugar house at the bottom, Dalen was able to produce 5,000 gallons of syrup by the time the season ended in April. Eighty percent of that was shipped off in bulk to a buyer in New Hampshire. Dalen retailed what was left and sold it locally under the name Dry Fork Maple Works. He’s not content being the state’s largest maple syrup producer. His goal is 50,000 taps. That would be larger than most operations in New Hampshire and Connecticut. 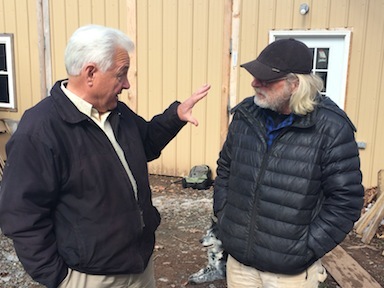 Dry Fork Maple Works’ John Dalen, right, and Agriculture commissioner Walk Helmick discuss the maple syrup industry. Helmick calls the syrup industry a “wonderful, wonderful opportunity” for the state of West Virginia. Dalen isn’t the only one making a profit from the maple syrup industry here in West Virginia. Jack Veara owns Samara Farms. Originally from Baltimore, Veara moved his family to Morgan County 12 years ago. An avid outdoorsman, Veara asked a friend to pick him up 5 taps on a trip to New England and that was the start of his maple syrup operation. This past season, Veara, produced 20 gallons of maple syrup which he promptly sold when his wife put out the word on Facebook. He’s installed new taps for this coming season and hopes to increase his output to 200 gallons. 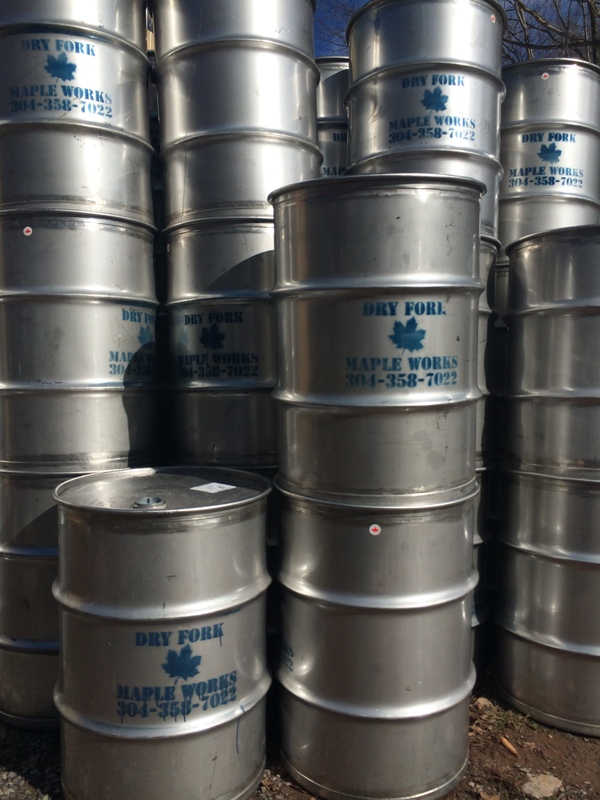 In 2014, 80 percent of the 5,000 gallons of syrup produced at Dry Fork Maple Works was shipped off in bulk to a buyer in New Hampshire. Agriculture commissioner Walk Helmick called it a “wonderful, wonderful opportunity” for the state of West Virginia. “I can see this industry doubling in the near future because the interest is there,” said Helmick. 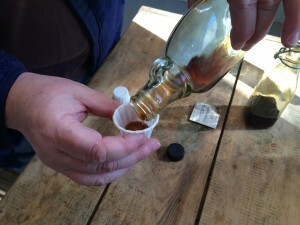 In 2015, about 30 maple syrup producers will tap their trees and hope for the sweet water to run.“We want to go to the level where we’re really competitive and can really make a difference financially and help the economy of West Virginia,” said the Commissioner.For more information on the industry, go to the West Virginia Maple Syrup Producers Association on Facebook. Article and photo provided by the West Virginia Department of Agriculture.